Museum Boijmans Van Beuningen digs into its history during the wartime years. In the autumn of 2018, Museum Boijmans Van Beuningen transports visitors into the history of the then Museum Boymans during and around the Second World War. Recent research provides the basis for the candid discussion and visualisation of this past. The presentation includes wartime acquisitions, visual documentation of exhibitions ‘back then’, and Rotterdam art from the years under occupation. From 13 October 2018 to 27 January 2019, Museum Boijmans Van Beuningen is examining its own past in the multifaceted exhibition ‘Boijmans in the War. Art in the Destroyed City’, produced by curator Peter van der Coelen and guest curator Sandra Smets. One of the reasons to stage the exhibition is the conclusion of the provenance research into the museum collection, which involved examining documentation of every artwork or artefact and wherever possible ascertaining their provenance. Two publications are being released to complement the exhibition. How do you maintain a museum’s vitality when the works of art are stowed away to protect them from the ravages of war? What do you do as an artist in times of censure and oppression? During the war, these questions were painfully relevant in Rotterdam. The bombardment of 14 May 1940 razed the historic city centre and many artists were left without a studio. Museum Boymans boasted the country’s most successful director: Dirk Hannema. Supported by the city council and private individuals, he built the museum into an institution of national significance. During the occupation he adapted pliably to the new regime, thus becoming the most controversial museum director as well. The story of the museum in wartime is presented against the backdrop of Rotterdam’s cultural life. The city’s reconstruction offered new opportunities for artists, as did the arts policy of the occupier. However, when the Nazis started to impose rules and obligations, artists were faced with a choice: cooperate, shut yourself away or resist. One of the exhibition’s galleries is devoted to casting light on the subject of looted art: before, during and after the occupation works ended up in the museum’s collection as a consequence of the large-scale theft of art owned by Jews by the Nazis, who came to power in 1933. This presentation reveals how the provenance of several works has been ascertained and their rightful owners traced. · A major symposium takes place at De Doelen in Rotterdam from 13:00 to 17:00 on 9 November, with Ian Buruma as keynote speaker (and Jort Kelder as chair of proceedings). Museum Boijmans Van Beuningen has used an oral history project to amass first- and second-hand memories of the museum during the war in partnership with Verhalenhuis Belvédère, a social history initiative in Rotterdam. This entailed speaking to parents, grandparents, neighbours and others about their memories of the then Museum Boymans during the Second World War, as well as about the Rotterdam art scene during this period. The collected stories are presented on a website and several narratives are included in the exhibition. If you have stories to share, please submit them via: info@verhalenhuisbelvedere.nl. With the publication by Ariëtte Dekker the museum aims to provide full transparency about its history in relation to and during the Second World War. The museum director flexibly complied to the wishes of the occupier and collectors affiliated with the museum sold works of art to the Nazis. At the same time, the museum played an important role as a hub for art, culture and cultural conservation in the blitzed city of Rotterdam. This Boijmans Study reconstructs the role of the museum and its patrons, as well as that of director Dirk Hannema, during the war. The picture would be incomplete without addressing the earlier history of the museum, which owed the enormous expansion of its collection to patrons such as the Rotterdam port barons D.G. van Beuningen and Willem van der Vorm, as well as the Haarlem-based banker Franz Koenigs. Their collecting activities and patronage played out in an era of great shifts in prosperity, with a thriving international art trade as a result. Author Dr Ariëtte Dekker is an independent researcher in economic history who has previously published a biography of Anton Kröller (2015) and a history of De Club Rotterdam (2008). The ambitious Dirk Hannema adapted himself to the demands and views of the occupier and cooperated with German initiatives. At the same time he used his position to help Jewish and non-Jewish artists and collectors, even managing to secure release from German detention for some. Dirk Hannema harboured an affinity with National Socialist ideology and was eventually appointed 'Authorised Representative for Museums' in Mussert’s so-called shadow cabinet. All he wanted to do in his museum was show art, but like other Dutch museum directors he eventually had to allow Nazi propaganda into his galleries. A scholarly biography of this successful but controversial museum director, who was dismissed after the liberation for collaborating, is being released by Uitgeverij Prometheus to coincide with the exhibition: ‘Hannema: museumdirecteur,’ by Wessel Krul, Professor Emeritus of Modern Art and Cultural History at the University of Groningen. An important reason for staging this exhibition and publishing the Boijmans Study is the conclusion of the provenance research that the museum has conducted over recent years in the context of the national research project ‘Museum Acquisitions from 1933 onwards’. The museum’s collection has been investigated to determine whether it is the steward of works of art with a dubious provenance. Attention was focused on works that were acquired after 1933 or had changed hands in the period between 1933 and 1945. After the Nazis seized power in Germany in 1933, Jews were persecuted and their belongings confiscated. This developed into the widespread looting of art before and during the Second World War, which involved works of art being plundered, confiscated or sold under duress at prices that were far too low. In Austria this occurred after the Anschluss, or annexation, of 1938, and in countries such as France and the Netherlands during wartime occupation. Via art dealers, auction houses or private parties, looted art sometimes ended up in Dutch museums. In later years museums also acquired art and artefacts, without knowing that these had been looted, confiscated or sold under duress during the Second World War. Provenance research has resulted in the restitution of seven works from the Boijmans collection between 1999 and 2009. This consequence of the war is explored in a separate section of the exhibition using a number of specific cases. Several returned works are being shown, thanks to the cooperation of surviving relatives. The stories of the families concerned and how the provenance was established feature alongside, as well as an explanation of restitution process. Also on show are works of art with provenances that raise questions. The ‘Boijmans in the War. Art in the Destroyed City’ exhibition is supported by Stichting Volkskracht, Prins Bernhard Cultuurfonds Zuid-Holland, Stichting stad Rotterdam anno 1720, Erasmusstichting, M.A.O.C. Gravin van Bylandt Stichting and an anonymous benefactor. The accompanying publication ‘Omstreden verleden. Museum Boijmans Van Beuningen en de Tweede Wereldoorlog’ has been produced with the support of Stichting “de Leeuwenberg”, Stichting Pieter Haverkorn van Rijsewijk and Stichting dr. Hendrik Muller's Vaderlandsch Fonds. In 1935, Rotterdam acquired an art museum of standing. The collection came into its own much better in the evocative rooms in the new building designed by architect Ad van der Steur than in the Schieland House, which had become far too small for the numerous recent acquisitions. The municipal acquisition budget was limited, but Hannema, the director, succeeded in securing many donations and bequests. For major acquisitions, he was able to appeal to the wealthy entrepreneurs from the Rotterdam Port, such as D.G. van Beuningen and Willem van der Vorm, or from sources outside the city, such as the Haarlem banker Franz Koenigs. Hannema had an eye not only for old masters but also for modern art, such as the abstract Mondrian. But none of the acquisitions had the status of ‘The Supper in Emmaus’ which was added to the collection in 1937 as an undisputed Vermeer. The opening of the new Museum Boymans also proved the start of a dynamic exhibition policy. Blockbusters featuring Johannes Vermeer and Jheronimus Bosch attracted international attention. Rotterdam, a modern port city with a vibrant nightlife, played out to a backdrop of jazz, attracted progressive architects, graphic design flourished and all new visual arts blew in. Artist association ‘De Branding’ organised exhibitions in which its own members exhibited among international avant-gardists. There was, typical for Rotterdam, patronage from the business community. De Bijenkorf and, in particular, Studio ‘32, founded by film pioneer Abraham Tuschinski, were stages for art. From 1935, the Rotterdam artist associations were allowed to exhibit their work annually in the new Museum Boymans. Artists wanted to contribute to a better world. Labourer photographers such as Wally Elenbaas recorded social injustices and left-leaning artists made anti-fascist and politically committed exhibitions (‘The Olympiad Under Dictatorship’). During the twenties and thirties, artists in Rotterdam like those in other parts of Europe, adopted figuration or a realistic style. On 10 May 1940, German paratroopers took the Waalhaven airfield, the North Island and the Maas bridges. A fierce battle raged for five days and was finally decided when the inner city was razed to the ground in a bombing attack, killing more than eight hundred and making tens of thousands homeless. The museum escaped. In Museum Boymans, the old masters had been stored away in the cellars since August 1939, together with vulnerable items of china, glass and silver. In the morning of 10 May, the museum staff moved the remaining works to the cellars and camped there, either alone or with their wives and children, until the capitulation. Immediately after the capitulation, 30,000 people started clearing away the rubble in the devastated inner city. Five special teams concentrated on saving historically valuable fragments of buildings and sculptures. The rescued items were collected in Museum Boymans, where the staff registered and preserved everything. When the above-ground salvage work had been completed, a ‘Tile Team’ set to work, at the initiative of Hannema, searching for tiles in the cellars of the demolished buildings. The Germans raised no objections when Hannema asked six artists to produce drawings of the devastated city. They were issued a special pass, an ‘Ausweis’, which allowed them to enter the closed off disaster area to make their sketches. In the first years of the war, the occupier wanted to win the Dutch for national socialism, so that they could be assimilated as ‘Germanic brother nation’ into the German Reich. Many people acquiesced in the situation, the more so since Germany seemed unlikely to lose the war. The devastated Rotterdam prepared itself for the reconstruction. Artists were given new opportunities thanks to a unique commissioning policy. Between September 1940 and March 1942, the town hall put in an order worth 70,000 guilders (in today’s money more than one million euro) for sculptures, murals, gable stones and shop signs for the emergency shops. This meant employment for dozens of artists who had suffered poverty during the crisis years. For the emergency shops on the Coolsingel, Han Richters designed the first Rotterdam war monument: ‘The fleeing woman’. She arose there in the beginning of 1941, together with her optimistic opposite number: ‘The Architect’. In the museum, too, work continued, although restrictions applied because of the risk of damage to the collection by acts of war. From 1942, when victory no longer seemed certain, the German regime became a lot harder and suppression increased. At the same time the mass deportation of Jews began. Four days after the bombing, city architect W.G. Witteveen was asked to make plans for the new Rotterdam. A model of his design was added in October 1941 to the exhibition ‘Holland builds in brick’ in Museum Boymans. This exhibition used photo panels to offer an overview of two centuries of brick architecture and was the most successful exhibition during the occupation. But it was also an stop-gap measure: it was no longer possible to mount blockbusters with masterpieces. 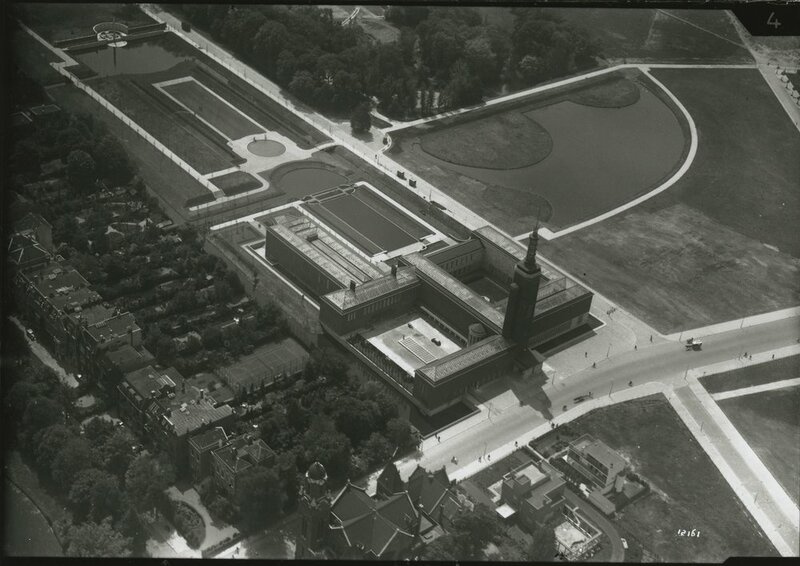 Witteveen’s plans for the reconstruction never saw fruition, for in 1942 a building stop was announced due to the scarcity of material and labour. The greater part of the museum collection was in storage, in the museum’s cellars and later also in the national storage facilities in Zandvoort, Maastricht (Sint-Pietersberg) and Paasloo. 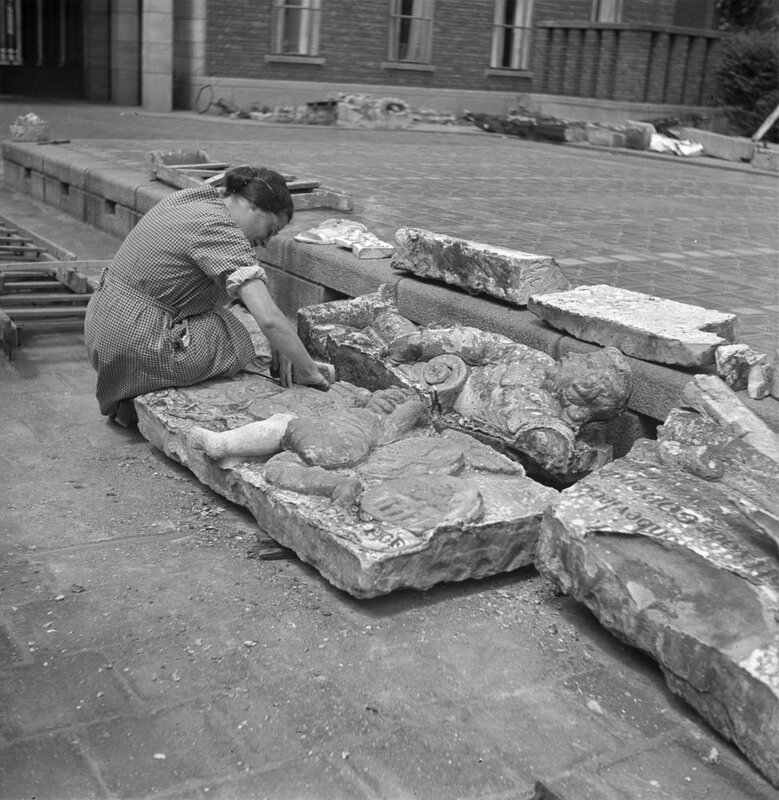 Urgent attention had to be given to securing the collection, for Rotterdam became the target of around 120 allied bombing raids, whereby Museum Boymans was hit two times. The collection of nineteenth- and twentieth-century paintings was still exhibited during the first years of the war, with one restriction: no work by Jewish artists. In 1940, Van Beuningen donated the major part of the former Koenigs Collection to the Museum Boymans Foundation. Hannema’s acquisitions of old master paintings remained limited, partly because of the enormous increase in prices and the competition from German collectors, including Nazi leaders such as Hitler and Goering. The arts and crafts department grew spectacularly, thanks to the acquisition of several private collections of ceramics. The print collection also grew in size, especially with the acquisition of nineteenth-century French and contemporary Dutch graphic art. Among the many acquisitions made in the war years were a few works which were later revealed as ‘looted art’ and were returned to the heirs of the original owners. This story is told elsewhere in the exhibition. Even though no blockbusters were held and planned exhibitions with famous contemporary artists such as Jan Sluijters and Charley Toorop were cancelled, the museum attracted on average 50,000 visitors a year. During the war years, they could visit no less than 44 exhibitions, mainly of graphic art, nineteenthcentury painting and contemporary Rotterdam art. In the first years of the war, Hannema refused to mount exhibitions proposed by the occupier, but in 1942 it became mandatory to mount the propaganda exhibition ‘The German Book of Today’. Following this, he worked with more enthusiasm on three other Nazi exhibitions. He was appointed Head of Cultural Affairs by the municipality, following which he organised exhibitions in other locations and supervised all cultural events in Rotterdam. Herman Bieling mounted group exhibitions of Rotterdam art in the museum. From 1942, the only artists eligible for exhibition were those registered with the Culture Chamber. ‘Art is not a matter for government’ was the motto in the Netherlands for many years. But after the bombing, the Municipality of Rotterdam involved artists and a commissioning policy arose. At national level, the occupier gave arts a role in the creation of a new society; the national art budget was increased fifteen-fold. In February 1941, Tobie Goedewaagen, secretary-general of the new Department of Public Information and Arts (DVK) announced in Museum Boymans the creation of a guild system that would restore the traditional bond between artists. In 1942, registration with the ‘Dutch Culture Chamber’, as the announced guild system was called, became mandatory. All artists received a registration form by post which they had to complete and return, together with a signed Aryan Declaration. Whoever failed to do this was excluded from professional practice: no material, no commissions, no exhibition possibility, no subsidies, no pension. Most Rotterdam artists registered; the objectors generally withdrew into the studio to make work as they saw fit, without exhibiting it. Although the Culture Chamber caused a schism, a lot of art was still seen after its creation. 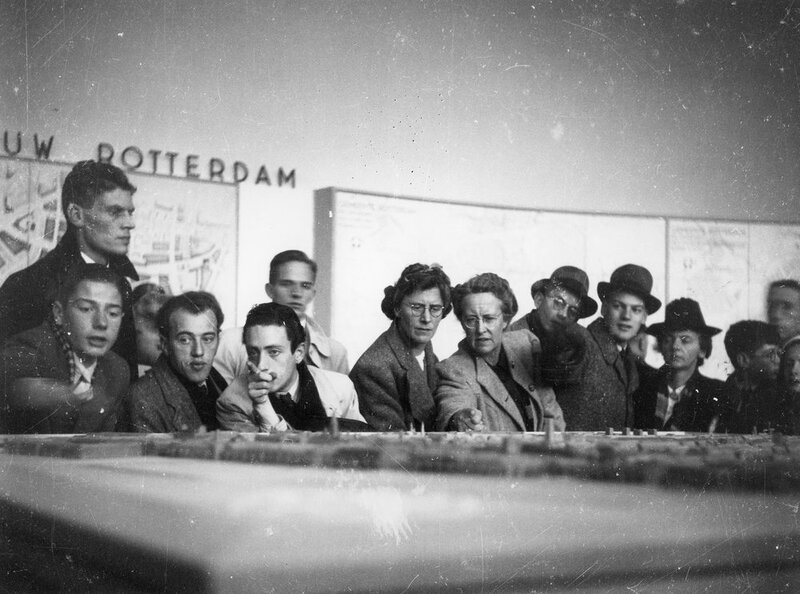 The number of galleries and art dealers in Rotterdam increased, the art academy had a growing number of applications, including some from young men wishing to avoid ‘Arbeidseinsatz’. Each year, Herman Bieling had sufficient submissions for the group exhibitions in Museum Boymans. At the same time, the press stressed the ideas of national character and traditions. Critics drew comparisons with old masters such as Hercules Segers and called Rembrandt ‘a political painter’. But they also raised questions about the one-sided supply: ‘Pots, tankards, jugs, jars, flowers, fruit, skulls, shells... remarkable that they do not become bored by being painted yet again!’ wrote the Algemeen Handelsblad on 28 September 1943. Just like other museum directors, Hannema worked with the occupier in order to keep his museum in operation. But he went further. He showed a great affinity with national socialism and became a member of advisory groups, held lectures and submitted contributions to publications of the New Order. In 1943, he had himself appointed by NSB leader Mussert as Authorised Representative for Museums, which meant he joined the Secretary of State of the NSB. He was not required to become a member of the party and on the installation photo he is the only person not wearing a uniform. His duties and powers as Authorised Representative were limited. He did use his title in efforts to help Jews who were threatened by deportation, arrested members of the resistance and hostages from the cultural circuit. On two occasions, collector and Boymans patron D.G. van Beuningen sold art to Hitler’s art purchaser Hans Posse for the planned Führer-Museum in Linz. In December 1940, he sold a selection of 528 drawings from the collection which Franz Koenigs had had to relinquish because of his debts to the bank. Van Beuningen had purchased the whole collection one month before the war for 1 million guilders and received 1.4 million for just the selection. He knew that transactions with the occupier were forbidden, but probably needed to pay his debt for the purchase of ‘The Three Marys at the Tomb’ by Jan van Eyck. A similar reasoning was behind the sale of eighteen paintings by old masters – incl. Watteau, Lancret and Pater – in July 1941. This time, the money was needed for the acquisition of ‘The Last Supper’, a supposed masterpiece by Vermeer. Van Beuningen did not sympathise with the occupier. In the last years of the war, he worked closely with the resistance on the Veluwe, where he made his estate available for allied weapon drops. For Museum Boymans, the liberation meant the end of the Hannema era. Hannema was arrested on 8 May on suspicion of collaboration and subsequently dismissed. The former director spent more than a year in the internment camp Vianda, after which the Rotterdam Tribunal acquitted him from any further prosecution. He was able to concentrate on expanding his personal collection, putting it in the hands of the Hannema-de Stuers Fundatie and thus became the founder of the current Museum De Fundatie in Heino and Zwolle. In Rotterdam, Coert Ebbinge Wubben picked up the baton as acting director. Under his leadership, and with the help of patron Willem van der Vorm, the collections were brought back from the national storage places. 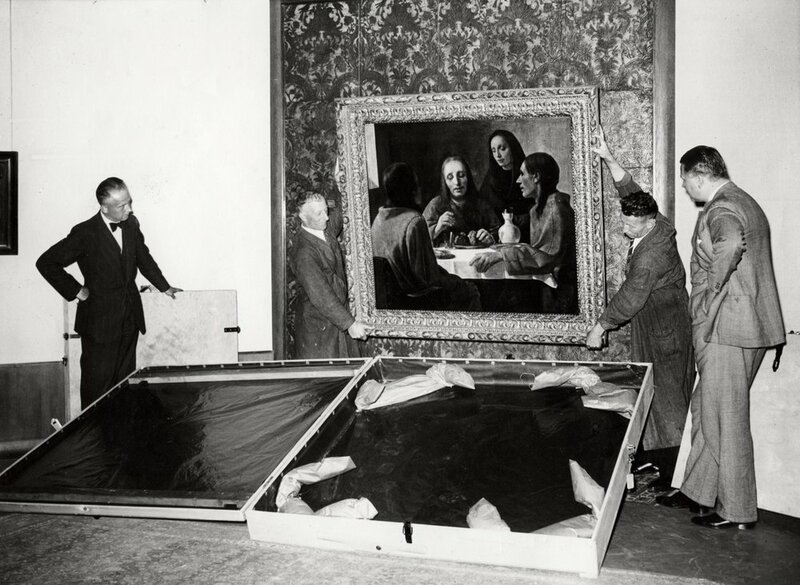 Art forger Han van Meegeren admitted that he had actually produced ‘The Supper at Emmaus’, and the museum lost its ‘Vermeer’. Fons Vorenkamp, who as member of the Monuments Men had worked on returning Dutch art from Germany, was for a short period director, but Ebbinge Wubben was finally appointed director of Museum Boymans in 1950, and he held this position until 1978. The highlight of his tenure was the acquisition of the Van Beuningen collection in 1958. After the liberation, the Honorary Council for the Visual Arts reviewed the role of artists during the war. Some were banned from exhibiting for six months, others were punished more severely. Artists knew what had happened to each other, without names being mentioned. The punishments were lenient, but reputations were destroyed. The art world in Rotterdam only recovered slowly. The pre-war artists collectives were disbanded and exhibition locations were almost non-existent: artists searched for new paths or combinations. A realistic style was associated with the occupier, so the search was for a modern style which expressed the era, with liberty and optimism. The work of Henk Chabot, who had withdrawn into seclusion, initially acted as an example and inspiration was also sought in the pre-war avant-gardes. Once material became available again, everything became large and colourful. But the war was not forgotten and pain and suppression remained important themes. After the liberation, the conviction grew that the Dutch art subsidy policy was a reward for the heroics with which the artists had defended themselves during the war. Improperly, the government just continued the occupier’s budgets for art. In 1947, the Jewish sculptor Ossip Zadkine designed a sculpture in which a figure cries to the heavens, his heart having been torn out. The bronze model was exhibited in Museum Boymans in December 1949. Zadkine’s embodiment of a war bombing attack touched a chord in the city which had lost its own heart. The Bijenkorf, a Jewish-owned company and also heavily hit, donated the full-sized sculpture to Rotterdam, where it was erected on Leuvehaven. Not only was it the ultimate war monument, it was, as a modern art work in a modern city, something which, after an initial period of uncertainty, earned the love of the city’s inhabitants. From 1933, the Jews in Germany and subsequently those in annexed Austria and the occupied countries, were persecuted. This led to the murder of six million European Jews; more than 100,000 were from the Netherlands. Part of the Jewish Persecution was the systematic theft of capital and goods. Countless pieces of art were confiscated or sold under pressure. In the period 1933-1945, this looted art infiltrated, via art dealers, auctions or private sales, into other collections, including those of public museums. Even after 1945, museums acquired works without having sufficiently investigated whether it was, in fact, looted art. In common with other Dutch museums, Museum Boijmans Van Beuningen has, since the late nineties, been investigating the provenance of works of art in its collection. Between 1999 and 2009, seven works with a problematic provenance have been returned to the heirs of the original Jewish owners. Recent investigation has again revealed a small number of pieces which could give rise to doubt. Possibly this was a question of involuntary loss of property. Several works have been submitted to the Restitution Committee set up by the Dutch Government for a binding advice. The others are published on the website of the national research project ‘Museum Acquisitions since 1933’ and that of the museum, with the call for anyone with information to make contact. The examples in this room highlight the complexity of the research. Rotterdam’s Depot Boijmans Van Beuningen - the world’s first publicly accessible art depot - will open in 2021. The Depot Boijmans Van Beuningen will be a unique space for exploration, interaction and discovery. The Depot will be the first museum storage facility in the world to offer public access to the largest part of the 151.000 artworks from the Museum Boijmans Van Beuningen collection without the mediation of a curator. ‘netherlands ⇄ bauhaus’, with over 800 Bauhaus objects, opens this weekend. It is the final major exhibition at Museum Boijmans Van Beuningen before its renovation. On the opening day – Saturday, February 9 – admission to the museum is free for everyone. Han Nefkens has bought an extraordinary dress from fashion house Viktor & Rolf at Paris Fashion Week. The patron has just announced that he is donating the work, called 'I Want a Better World', to Museum Boijmans Van Beuningen in Rotterdam. In 2019 Museum Boijmans Van Beuningen is paying tribute to the Rotterdam-based artist Co Westerik, who recently died at the age of 94, with a retrospective of his art and his diaries. It is the first time these private journals are on display. Before work starts on the ambitious programme of renovating and refurbishing the museum, we are pulling out all the stops again. In February 2019, Museum Boijmans Van Beuningen kicks off the Bauhaus centenary with a huge exhibition about the legendary art and design school, whose influence is felt to this day.